Living area with sleeper sofa. Open living, dining and kitchen areas. Open living, dining and kitchen areas. Living area with sleeper sofa. 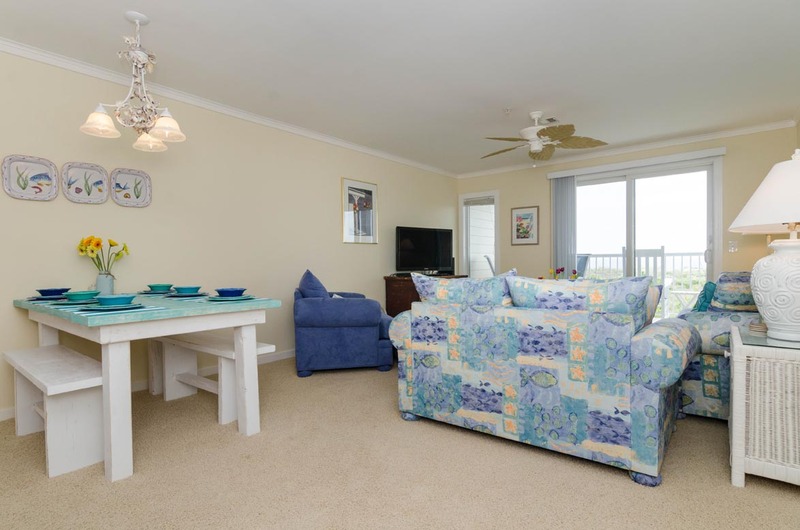 Enjoy the sounds of the ocean on the living room balcony. View from living room balcony Dining and kitchen with bar seating. Kitchen with bar seating Kitchen Kitchen Master bedroom with king bed and private bathroom. Master bedroom with king bed and private bathroom. Master bedroom with king bed and private bathroom. Master bathroom. Guest bedroom with pyramid bunk (one twin & one double bed) with a twin pull out trundle. Guest bedroom with pyramid bunk (one twin & one double bed) with a twin pull out trundle. Guest hall bathroom. Guest bedroom with queen bed. Guest bedroom with queen bed. Beach access located just to the south of building. Beach view of condo building. Beach area. Beach area. Street view of condo building. 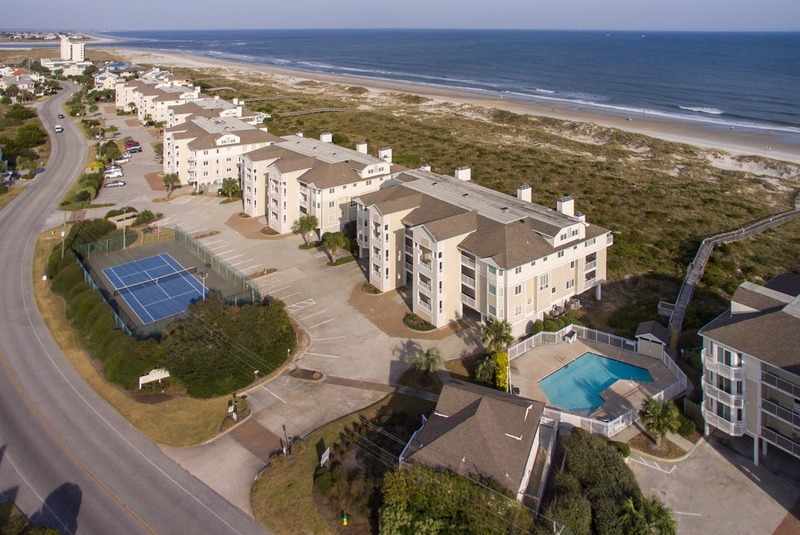 Community pool Pool area located at building H. Aerial view of Wrightsville Dunes community. ***Renovations were completed March 2019 and updated photos will be coming soon! 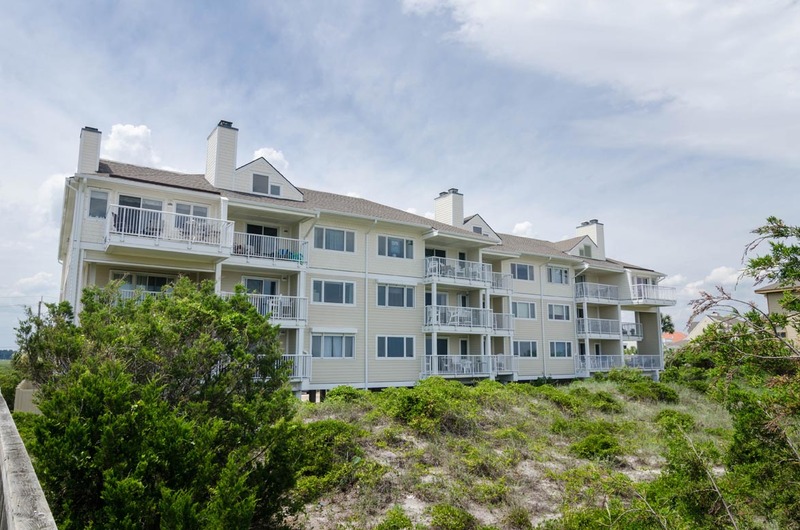 This beautiful 3 bedroom, 2 bath oceanfront condo located in Wrightsville Dunes features an updated kitchen and tastefully updated baths. 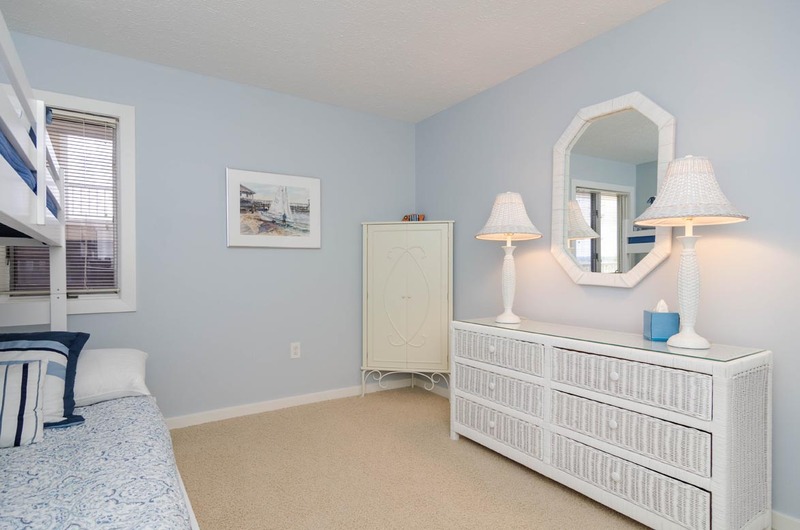 Located on the northern end of Wrightsville Beach, nestled among the sea oats and sandy white dunes, this condo has many special features that help offer comfort and enjoyment for your vacation. 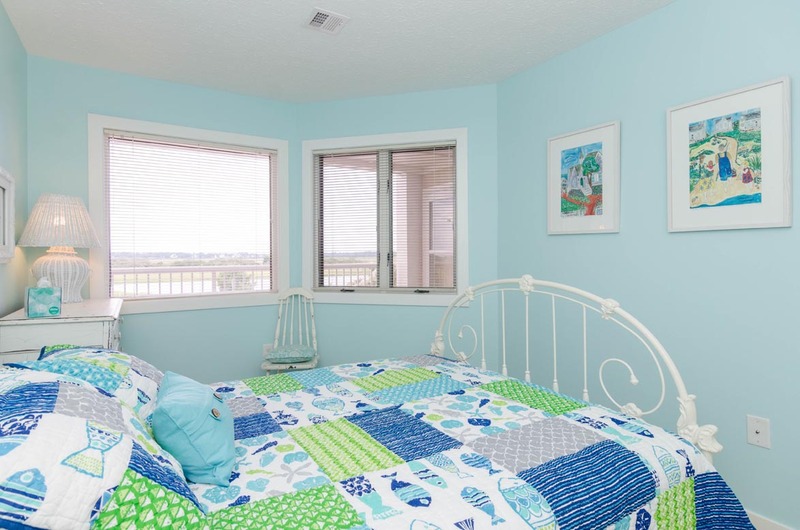 The master suite is oceanfront with a king bed that is positioned perfectly to offer the view of the blue waters of the Atlantic Ocean along with picturesque sunrises. Relax on your deck while enjoying the cool sea breezes and ocean sounds to lull you into a state of total rest and relaxation. 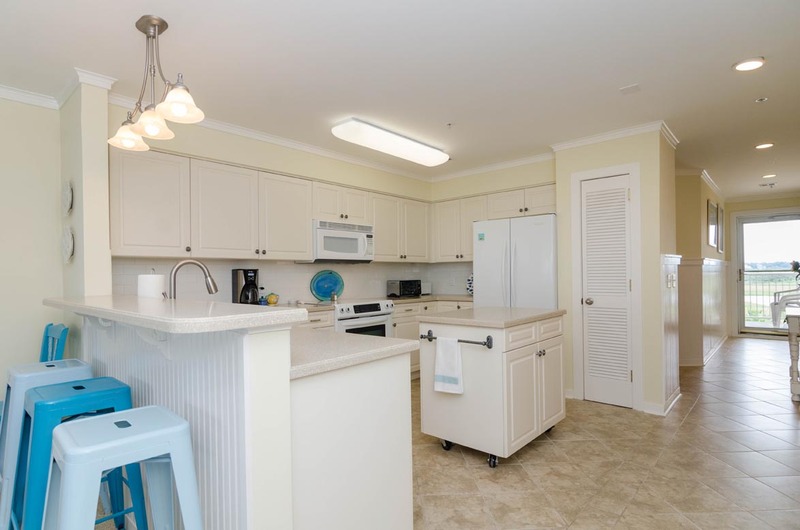 The condo is all on one level which features a well-equipped kitchen, dining and living room combination along with 2 sound side guest bedrooms. Guest bedroom one has a pyramid bunk (one time and double bed) with a twin pull out trundle. Guest bedroom two has a queen. Each have water views of the tidal marsh which offers seasonally changing colors. Amenities include a building elevator with service to all floors, tennis court, private beach access and 2 swimming pools. A great place for vacation memories! There are 2 parking spaces. Occupancy: 8-10. No Smoking. No Pets. Paul, We are happy to hear that you enjoyed the condo and amenities! Our staff will be happy to address the situation with the vacuum and ice maker; we appreciate you making us aware of these potential issues. 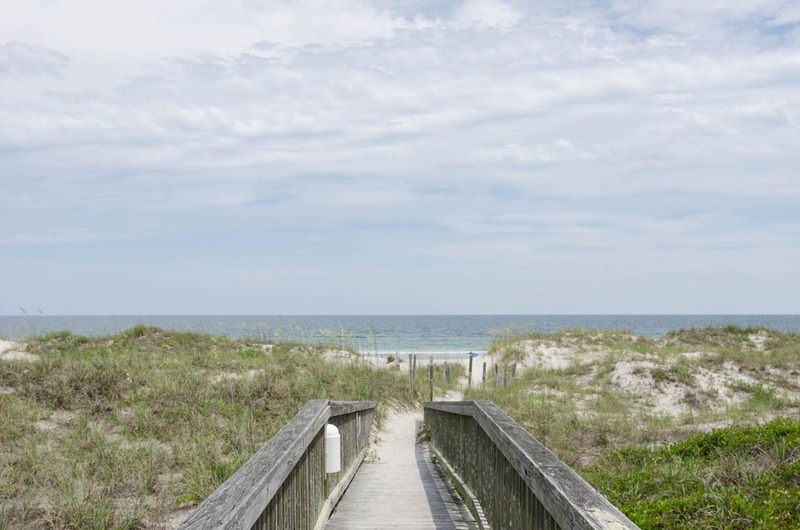 Thanks again for the feedback and we hope you can visit Wrightsville Beach again soon! We rented this unit based on other positive reviews. After we had already paid our deposit, we saw newer reviews complaining of smelly water issues we had not seen before. We immediately contacted the management company and were assured the odor issues only happened in slower winter months but not during peak summer months when the water tank is emptied and refilled frequently. From the moment we arrived, however, we encountered disgusting sulfur smells from every sink and shower. The smells were almost overwhelming when showering. We contacted management multiple times. To their defense, it’s really a failure on the owners’ part to not put in updated parts that could filter out the foul smells. Bryant management services did a good job all week of addressing multiple issues (key pad on door failed upon our arrival and was fixed immediately, blinds in all the rooms were broken and Bryant maintenance employee came inside and tried to fix but ended up forcing all blinds into an open position for us for the week , Bryant provided ample linens and unit had been well cleaned for our arrival, etc). The kitchen in this unit was like showing up at a yard sale as far as all the pots, pans, dish ware, etc. We never did find a frying pan that would cook without ruining the eggs. This kitchen needs serious owner attention. Overall, this unit was overpriced for the odor issues and multiple shortcomings throughout the rental. We would not recommend it for others. UPDATE: As of March 2019, the property owner has replaced the water heater including an up-to-date zinc/aluminum anode eliminating the hydrogen sulfide smell. Jeff- Thank you for your feedback. Disappointed to hear you had a few issues but happy to hear they were all rectified in a timely manner! We will look into kitchen furnishings you mentioned and address accordingly. Thanks again for visiting with us at the beach, hope to see you again soon! 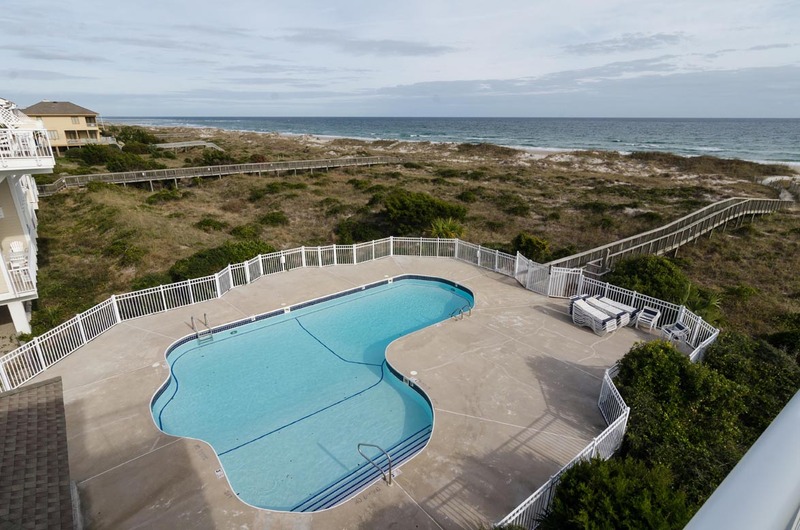 The rental was perfect for our needs as a family of three with easy access to the beach and pool. The unit is well maintained but it appeared it was only given a light cleaning before our arrival. A layer of sand and dust was found on surfaces and the porch was extremely sandy. Upon check in, we were not notified that our designated parking would be occupied by a roofing company performing work on the building. This required a constant jockeying of cars throughout the week, a heads up would have been appreciated before our arrival. 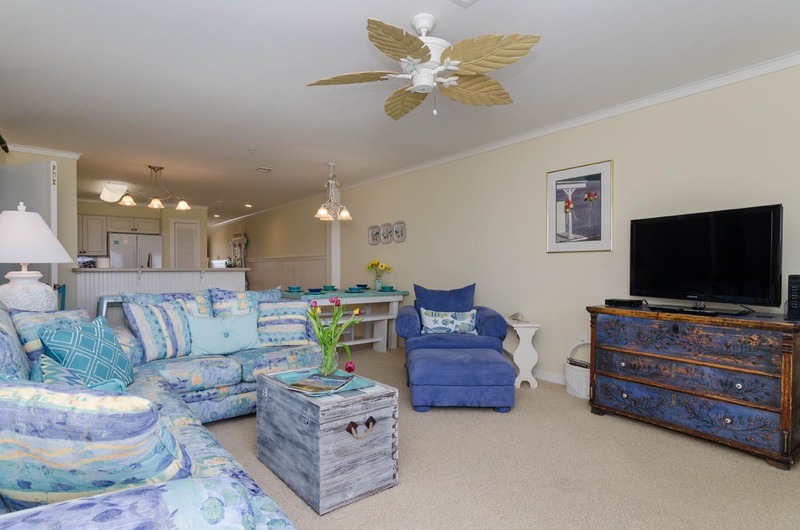 All matters aside, this unit is perfect for a beach rental. Hi Matthew, Thank you for your feedback and we apologize for the challenges associated with the work at Wrightsville Dunes. This work was supposed to be completed over 2 months ago. The contracts move around and we sadly have no control over their work. We do get updates, but the updates simply state the work is going to take longer. All in all, we are glad you enjoyed your stay and we are happy this major work will be behind us, and we look forward to hosting a better stay for you and your family next year! We had a great vacation (as always) in Wrightsville Beach. 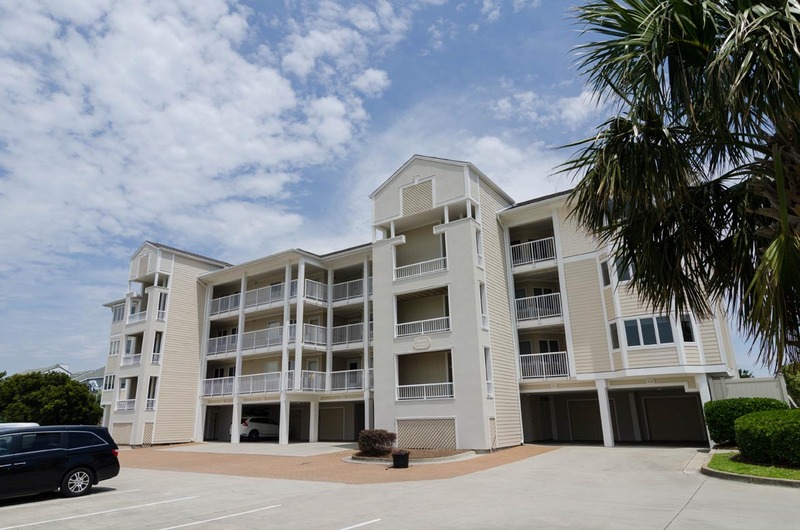 We really enjoyed this condo - it was comfortable and everything was in good condition. We would definitely rent it again. 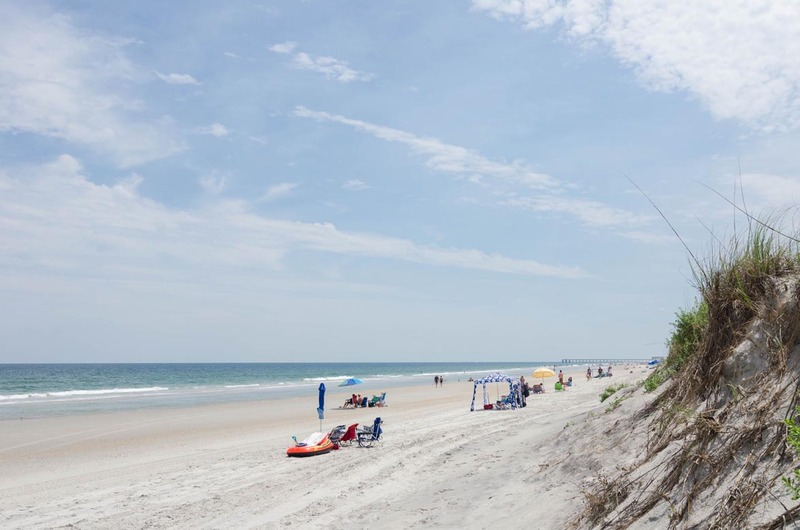 We had a great time staying Wrightsville Dunes. 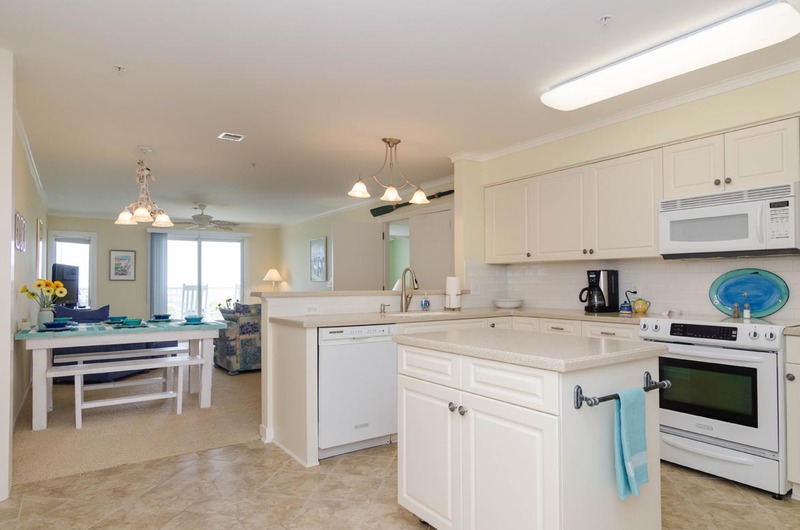 Our condo was beautifully decorated and clean with a beautiful view of the ocean. Wonderful!!! Great location, facility...could not have asked for any nicer. Hope to see you next year. This is a very nice space. Comfortable and wonderful views of the ocean. The water has the most powerful sulfur smell I've ever encountered though. When someone takes a shower the smell permeates the entire unit. Surely something could be done to address that. The list of items you need to bring on your own is a little absurd. Completely fine with bedroom and kitchen linens, which are available to rent as well, but coat hangers? Ridiculous. Again, the place is clean and the furnishings are very comfortable. A nice weekend place overall. UPDATE: As of March 2019, the property owner has replaced the water heater including an up-to-date zinc/aluminum anode eliminating the hydrogen sulfide smell. Leanne, We are glad that you enjoyed this beautiful property and the views! We typically drain the water heater tank prior to a guest’s arrival, if the property has been vacant, as this is the best way to remove this odor. We apologize this was not done before you arrived. Our suggested list of “what to bring” is generally more than any given rental unit may require, however, items such as coat hangers tend to be taken from properties and there may not always be a sufficient amount for each guest’s needs. We suggest guests to bring these items to prevent inconveniences, although we are more than happy to provide supplies of this nature in the event the property is not furnished with them. We greatly appreciate your feedback and we hope to see you back at the beach again soon! 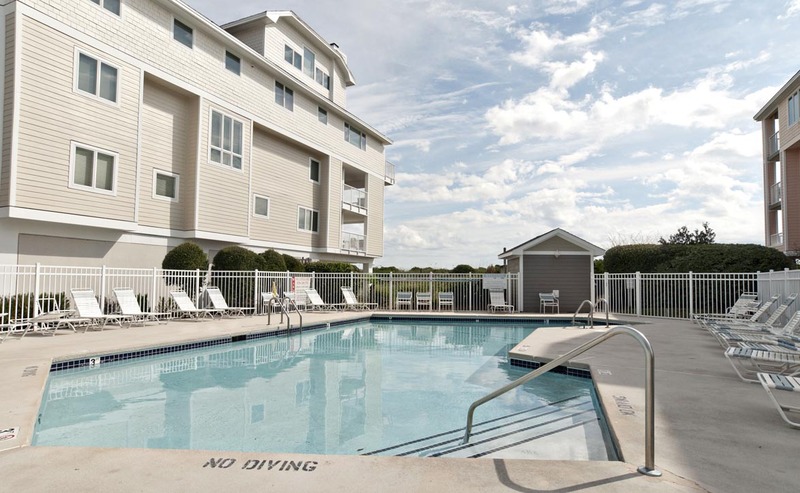 After reviewing several condos on Wrightsville Beach for my birthday weekend I selected this condo based on the following. Location, decor was pleasing and beachy, good reviews by others and the price fit my budget. Overall we were very satisfied with the condo. There were only a few things we found a little unpleasant. The first time we turned on the master bath sink the water was black. Then when the bathtubs in both bathrooms there was an awful sulphur gas smell. It was not pleasant to take a shower. The shades going to the deck were missing several blinds leaving a huge gap where the deck doors should have been covered. On check out day I received a message that it was past check out and the keys could not be located. The keys were dropped in the drop box at 9:40 that morning. I did get a follow up call that they were located. A suggestion maybe check first. I called the office about the keys and alerted the person about the blinds and the guest bath toliet paper holder was loose plus the water smelling. The person at Bryant aplogized for the call about the keys and the water smell. It would have been nice to have had a heads up about the water smelling like sulphur because we probably would have stayed some place else. I would stay here again but would call the office first about the water. UPDATE: As of March 2019, the property owner has replaced the water heater including an up-to-date zinc/aluminum anode eliminating the hydrogen sulfide smell. Hi Mitzie- thank you for your feedback! We are so glad to hear that you enjoyed your stay. We are sorry about the water! At the beach, when water heaters go unused for a period of time, the water tends to smell like sulfur when first turned on. This can be remedied by letting the hot water heater drain and then refill. We should have done this for you before you arrived, and I'm sorry that it was overlooked. Thank you for letting us know about the blinds as well. We will be sure to contact the owners and see if we can get that remedied before our summer season. I'm also sorry for the unnecessary call about the keys. I'm sure that was not a pleasant way to end your stay. However, we are glad that we were able to issue you an apology on the phone and that you were able to enjoy the unit. Thank you again for your comments, and we hope to see you back at the beach again soon! We had an enjoyable time. Luckily the weather was nice and we could spend time on the beach. To our surprise the pool was not open. According to the description we were lead to believe the pool would be open. There was no disclosure stating the pools are only open from Memorial day to Labor Day. Big disappointment and part of the reason I have the stay 3 stars. Hi Lisa- thank you for your feedback! We are glad you were able to enjoy the beach and your stay. I apologize for the disappointment about the pool. Because it is an outdoor, unheated pool, it is seasonal. The few pools we have that are heated are advertised as such, but I am sorry that this seemed unclear. Thank you again for your comments- we hope to see you back at the beach again soon.